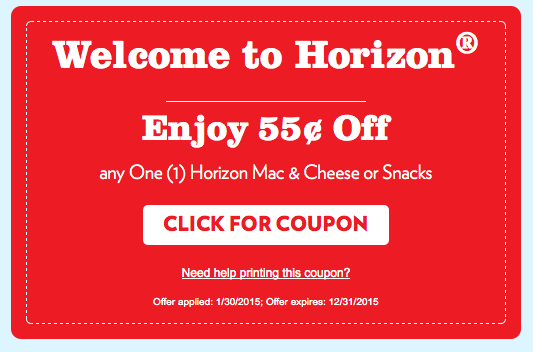 Price Chopper Next Week: FREE Horizon Mac & Cheese or Cheap Snack Crackers! *To see this coupon you need to click on "my profile" & fill it out, otherwise the link will say no coupons available at this time. Print limit 2. Starting Sunday Horizon Classic Mac & Cheese will be on sale for $1 each plus use in ad $3/4 coupon = 4 FREE w/ in ad coupon & (1) $0.55/1. Use the other print w/ in ad coupon again (on another day as q says one per day) = 4 more FREE! (or use (4) $0.55/1 + in ad coupon = 4 FREE + $3 profit!) A nice stock up opportunity.